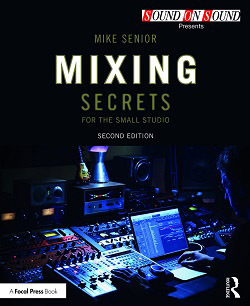 Effects Of Monitoring Volume: If you don't check how your work sounds at a selection of appropriate monitoring volumes, then your mix's overall tonality is more likely to be skewed on account of your ear's level-dependent frequency sensitivity, as in these examples of real-world home-studio mixes submitted to Mix Rescue: a mix monitored too loud (Ex04.01:WAV/MP3 ) and a mix monitored too quiet (Ex04.02:WAV/MP3 ). Affordable Stereo Monitor Controllers: As mentioned in the book, a dedicated monitor controller is an excellent purchase for the small studio, and for mixing purposes I'd recommend a model with the following features: three independently switchable monitoring outputs (for your nearfields, Auratone-substitute, and grotboxes); a headphone socket; and a mono switch. Here are a couple of options which fit this spec at a reasonable price: SPL's MTC 2381 (which I use myself); Mackie's Big Knob (just count those double entendres!). There's also the SM Pro Audio MPatch 2.1, which is a passive device (which helps with audio quality but doesn't allow for any gain though the system, of course). The Samson C-Control is very cheap, and offers a lot of functions, but I personally remain unconvinced of its build quality and ease of repair -- an important consideration given that the pots and switches of a monitor controller inevitably get a lot of wear. Automatic Loudness-matching Plug-in: Adjusting the levels of different reference tracks to match your mix in progress can be a chore, but there is an affordable plug-in from Klangfreund that can help by analysing the tracks during playback and adjusting the channel gains automatically: LUFS Meter . It's very easy to work, and I use it all the time these days. Using A Reference Monitoring Level: Some engineers argue for setting up a constant reference monitoring level using a sound-pressure-level meter. Although I remain to be convinced of the value of this approach myself, here's a good Sound On Sound magazine article about it if you want to experiment with the idea further.